Taken from a transcript involving a suit filed by a mid-west father who lost a child through the agency DFCS and keep in mind to our many readers and supporters, that during such time of the caseworker willfully and knowingly,with such malice lying on such parent, the father was eventually after long time reunited with both children...Such reunification happened with his children when and ONLY when he execute a lawsuit out of state court and in federal district court against three caseworkers and a supervisor along with the city and county. A shoe,phone,book,helmet were all thrown allegedly at the teen-child age 15 at the time, (removed at only 12) all thrown, at the child,along with kitchen utensils,such lawsuit cites, along with the foster parent constantly talking bad about his parent. A report to the hotline also confirms the daughter was also at risk but no physical abuse. Child have suffered(physical) + emotional abuse,under state supervision. Son is now of age (19)and he also won an additional amount for what is known as "punitive damages 250,000." Caseworker cites such falsities to keep child from his own father. The son is at risk, as his older daughter. -I've visited the children and both are "not afraid to live with the foster parent judge, actually 1 wants to be adopted by the foster parent. "He love him more than his own father. "The father is a mechanic,but he also is a drug addict who also stays out all night drinking while kids are home alone,or with the father girlfriend who also is an addict. 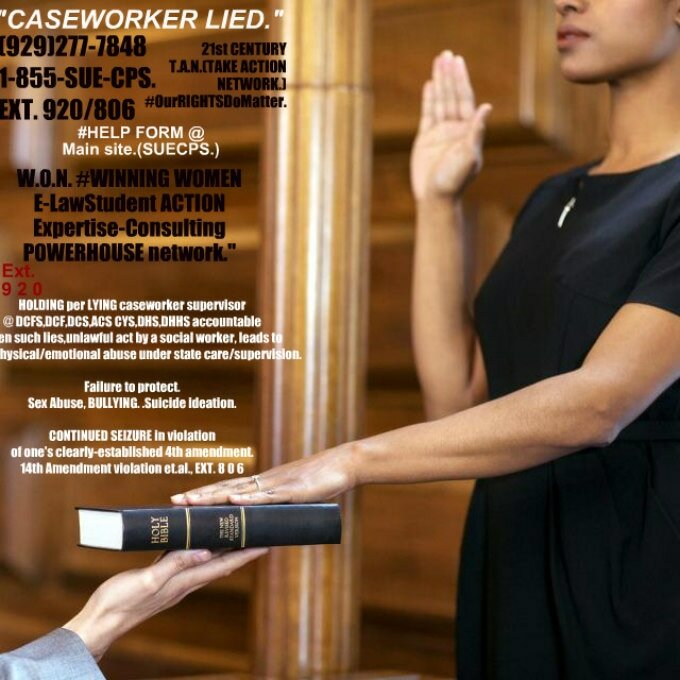 The father was able to prove DFCS agency employee was nothing more than a LIAR, who engage in perjury throughout his prior state family dependency/juvenile case. He won his lawsuit, for almost 1/2 of million in damages.Children won an additional for what is known as PUNITIVE DAMAGES. Such suit did not make news headlines. More shall be discussed at your 1-on-1 POWER SESSION and good luck to all who are WISELY holding such agency cps employees individually accountable while you're still having time to do so. Then, call in 20 minutes after submission(and)check FIRST your email for a validation on such appointment information/schedule info for your 1 on 1 same day/next day.Thank you.